One of my all time favorite movies at Christmas was the original “Miracle on 34th Street” about a small child who found it difficult to believe in Santa Claus and how she came to believe in both the man and the spirit of Christmas. This spirit manifested itself in the form of Kris Kringle, a real life Santa Claus who came to work at the famous New York department store, R.H. Macy’s and Company, through a series of interesting events. My parents had always told me that the department store Santa I went to see each Christmas at Rich’s was not the real Santa but one of Santa’s “Helpers” so I always thought that the real Santa was the one who came to New York every year because there were more children in NYC than anywhere else in U.S. I never got to go to NY until I was an adult but I had always harbored a desire to take my own children there someday if I ever had children and got the chance to do it. It was something I always wanted when I was a child but it never worked out that way. 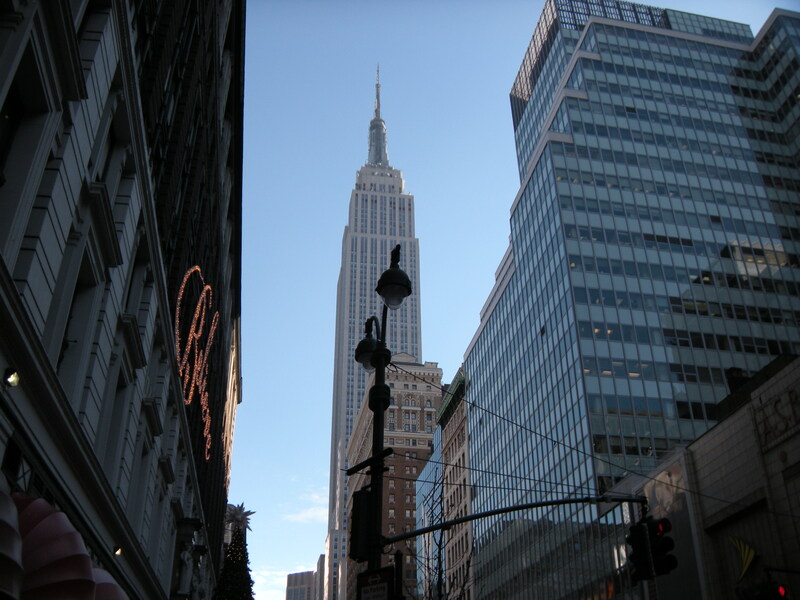 For day 3 of our “Christmas in New York” trip, we did just that and it was everything I had always dreamed it would be. After a quick, bumpy cab ride (in a Lexus cab no less!) 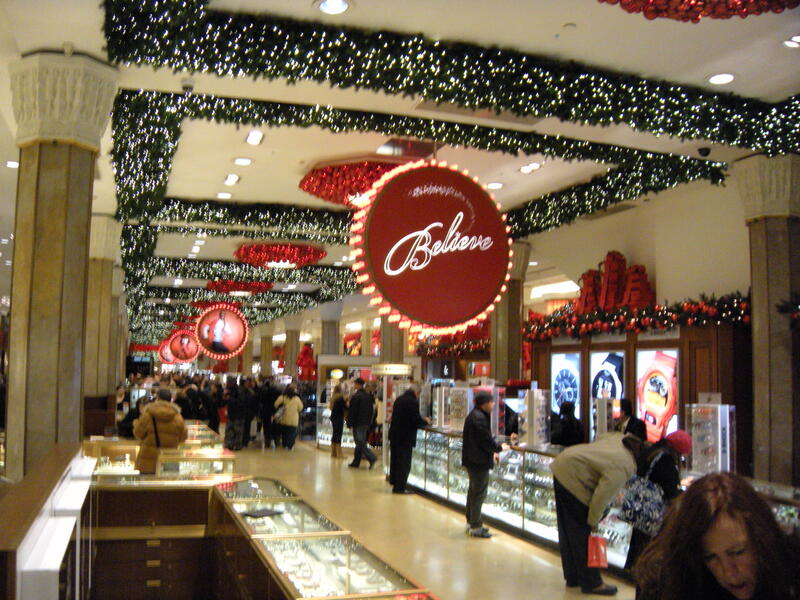 we arrived at the famous department store, all decked out for the holidays and surrounded by thousands of New York shoppers milling around at all sides. The famous store windows on the outside were pictures into another world and we marvelled at the classic scenes of Christmas that were displayed for enjoyment along the 34th street walk. We entered and were amazed at the thousands of lights that twinkled from the ceilings all through the main shopping lanes, with the world “Believe” prominently displayed. Making our way to the 8th floor via escalators, some of them original, narrow wooden models, we found ourselves in a line of parents and children making their way to the “North Pole”, the gateway to Santa himself. The line wasn’t too long and moved quickly into the rear of a magical train with light, sound and motion, complete with the feel of the tracks under your feet. Upon arriving at the north pole station, we disembarked and walked slowly through a maze of Christmas delights, including trees, toys, a large bag of toys and Santa’s sleight itself, being loaded with toys soon to be delivered. Toy trains wound their way around, whistling merrily and glittering with lights through the snow while Christmas bears danced in brightly adorned costumes as the helpful elves guided us to our rendezvous with Santa himself. Eventually we found ourselves with an elf who asked us our names and where we were from and we told her that we had come all the way from Georgia to meet Santa Claus, after which she smiled and took us to a large wooden door and there we saw the Great Man himself, seated on a large, ornate chair and smiling with delight as our son shyly stepped forward to meet him. 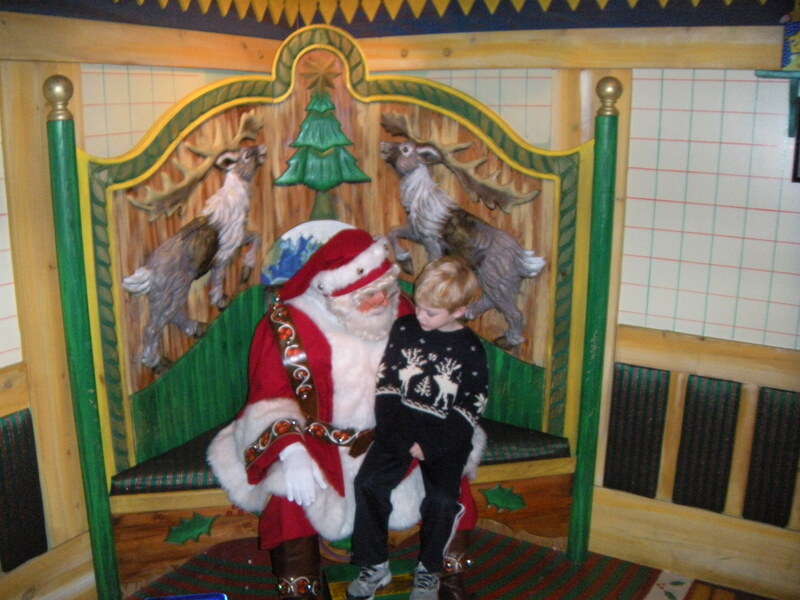 He was dressed like the real Santa should be, in fine, dark red trimmed with white fur and elaborately patterned trim. He looked old and wise but his eyes were smiling as he beckoned our son to come to him. He talked to him a minute and then asked him what he wanted for Christmas, to which our son answered “Surprise me”. Santa laughed at this and whispered something in his ear and my son nodded and hopped down. We thanked Santa for generously giving us his time and we headed back to the land of reality. We found out that Santa had given him some instructions for leaving feed for his reindeer who would no doubt be tired by the time they got all the way down to Georgia and we assured him we would help him get what was needed. I cannot describe how I felt at this moment, for in giving him a once in a lifetime chance to meet Santa, I had fulfilled a childhood dream of my own and experienced a bit of the wonder and excitement that he felt that day. I don’t know how much of this he will remember but I will always remember the moment and treasure it from now on. I choose to believe in Santa Claus, in the spirit of Christmas that he symbolizes and the joy he brings to millions around the world…and I will always be grateful to Mr. Macy for providing a way for Santa to meet millions of his fans, young and old, over many, many years. I know Santa will endure because as long as children of all ages and generations continue to believe in him and keep Christmas in their hearts, Santa will continue to provide the magic that symbolizes the giving spirit of the season, today and always.